It’s no secret: effectively-targeted employee benefits are vital in today’s workplace. Gone are the days of cookie-cutter standard packages. 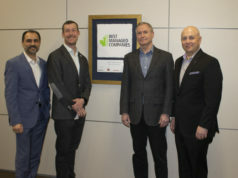 “More and more organizations understand that competitive benefit packages are critical to employer differentiation, and to attract and retain talent,” explains Melanie Jeannotte, the Western Canada president of Arthur J. Gallagher & Co., the global insurance brokerage, risk management and consulting services firm that recently acquired Calgary-based HFG Benefits. She points out that, according to recent Canadian benefits stats, the most popular contemporary workplace benefits have near universal acceptance among employers: prescription drug coverage is offered by 99 per cent of employers nationally and 100 per cent in Alberta; paramedical services coverage, dental plans and extended health coverage are offered by about 92-95 per cent nationally and 96-99 per cent in Alberta. Despite a popular myth that there is a disconnect between the wants and needs of younger employees versus more senior staff members, the benefits industry numbers beg to differ. While extra vacation, flextime and perks like PDAs, fitness memberships and spa time do exist, the Canadian edition of Gallagher’s 2018 Benefits Strategy & Benchmarking Survey demonstrates the real picture in the workplace is much more solid and traditional. “With five generations in the workforce (traditionalist, boomer, gen X, millennials, gen Z), employers must adapt to satisfy a wide range of employee wants and needs within an affordable structure,” Jeannotte adds. Another workplace myth: younger employees will jump from multiple employers throughout their work lifetime and conventional retirement planning is not on their radar. Not so, according to the survey, which highlighted that 77 per cent of Canadian employers and 75 per cent of Alberta employers offer retirement programs.